Summer days are gone and I am back to work. I thought that Terry Tao’s criticism to my work was finally settled and his intervention was a good one indeed. Of course, people just remember the criticism but not how the question evolved since then (it was 2009!). Terry’s point was that the mapping given here between the scalar field solutions and the Yang-Mills field in the classical limit cannot be exact as it is not granted that they represent an extreme for the Yang-Mills functional. In this way the conclusions given in the paper are not granted being based on this proof. The problem can be traced back to the gauge invariance of the Yang-Mills theory that is explicitly broken in this case. Terry Tao, in a private communication, asked me to provide a paper, to be published on a refereed journal, that fixed the problem. In such a case the question would have been settled in a way or another. E.g., also a result disproving completely the mapping would have been good, disproving also my published paper. This matter is rather curious as, if you fix the gauge to be Lorenz (Landau), the mapping is exact. But the possible gauge choices are infinite and so, there seems to be infinite cases where the mapping theorem appears to fail. 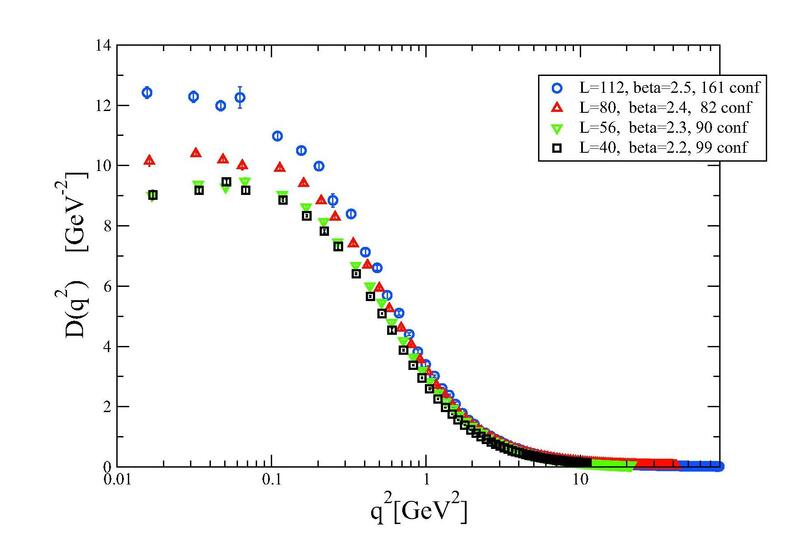 The lucky case is that lattice computations are generally performed in Landau gauge and when you do quantum field theory a gauge must be chosen. So, is the mapping theorem really false or one can change it to fix it all? In order to clarify this situation, I decided to solve the classical equations of the Yang-Mills theory perturbatively in the strong coupling limit. Please, note that today I am the only one in the World able to perform such a computation having completely invented the techniques to do perturbation theory when a perturbation is taken to go to infinity (sorry, no AdS/CFT here but I can surely support it). You will note that this is the opposite limit to standard perturbation theory when one is looking for a parameter that goes to zero. I succeeded in doing so and put a paper on arxiv (see here) that was finally published the same year, 2009. The mapping exists in the asymptotic limit of the coupling running to infinity (leading order), with the notable exception of the Lorenz (Landau) gauge where it is exact. So, I sighed with relief. The reason was that the conclusions of my paper on propagators were correct. But these hold asymptotically in the limit of a strong coupling. This is just what one needs in the infrared limit where Yang-Mills theory becomes strongly coupled and this is the main reason to solve it on the lattice. I cited my work on Tao’s site, Dispersive Wiki. I am a contributor to this site. Terry Tao declared the question definitively settled with the mapping theorem holding asymptotically (see here). As generally happens in these cases, the only fact that remains is the original criticism by a great mathematician (and Terry is) that invalidated my work (see here for a question on Physics Stackexchange). As you can see by the tenths of papers I published since then, my work stands and stands very well. Maybe, it would be time to ask the author. Today it is appeared a definitive updated version of my paper on confinement (see here). I wrote this paper last year after a question put out to me by Owe Philipsen at Bari. The point is, given a decoupling solution for the gluon propagator in the Landau gauge, how does confinement come out? I would like to remember that a decoupling solution at small momenta for the gluon propagator is given by a function reaching a finite non-zero value at zero. 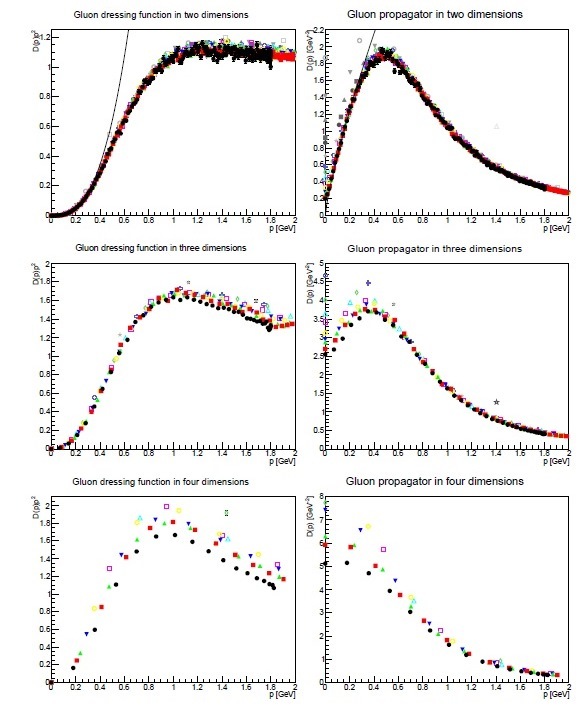 All the fits carried out so far using lattice data show that a sum of few Yukawa-like propagators gives an accurate representation of these data. To see an example see this paper. Sometime, this kind of propagator formula is dubbed Stingl-Gribov formula and has the property to have a fourth order polynomial in momenta at denominator and a second order one at the numerator. This was firstly postulated by Manfred Stingl on 1995 (see here). It is important to note that, given the presence of a fourth power of momenta, confinement is granted as a linear rising potential can be obtained in agreement with lattice evidence. This is also in agreement with the area law firstly put forward by Kenneth Wilson. At that time I was convinced that a decoupling solution was enough and so I pursued my analysis arriving at the (wrong) conclusion, in a first version of the paper, that screening could be enough. So, strong force should have to saturate and that, maybe, moving to higher distances such a saturation would have been seen also on the lattice. This is not true as I know today and I learned this from a beautiful paper by Vicente Vento, Pedro González and Vincent Mathieu. 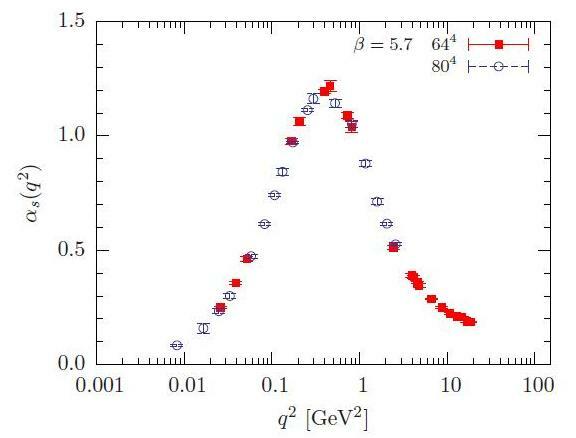 They thought to solve Dyson-Schwinger equations in the deep infrared to obtain the interquark potential. 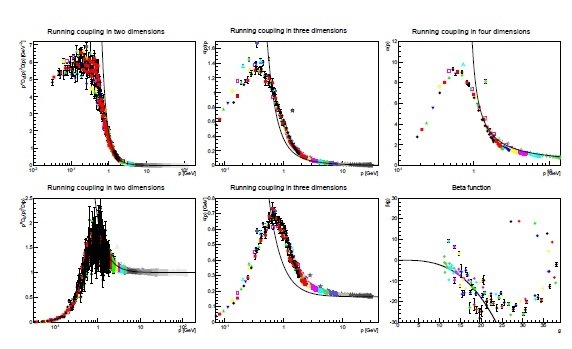 The decoupling solution appears at a one-gluon exchange level and, with this approximation, they prove that the potential they get is just a screening one, in close agreement with mine and any other decoupling solution given in a close analytical form. So, the decoupling solution does not seem to agree with lattice evidence that shows a linearly rising potential, perfectly confining and in agreement with what Wilson pointed out in his classical work on 1974. My initial analysis about this problem was incorrect and Owe Philipsen was right to point out this difficulty in my approach. This question never abandoned my mind and, with the opportunity to go to Montpellier this year to give a talk (see here), I presented for the first time a solution to this problem. The point is that one needs a fourth order term in the denominator of the propagator. This can happen if we would be able to get higher order corrections to the simplest one-gluon exchange approximation (see here). In my approach I can get loop corrections to the gluon propagator. The next-to-leading one is a two-loop term that gives rise to the right term in the denominator of the propagator. Besides, I am able to get the renormalization constant to the field and so, I also get a running mass and coupling. I gave an idea of the way this computation should be performed at Montpellier but in these days I completed it. The result has been a shocking one. Not only one gets the linear rising potential but the string tension is proportional to the one obtained in d= 2+1 by V. Parameswaran Nair, Dimitra Karabali and Alexandr Yelnikov (see here)! This means that, apart from numerical factors and accounting for physical dimensions, the equation for the string tension in 3 and 4 dimensions is the same. 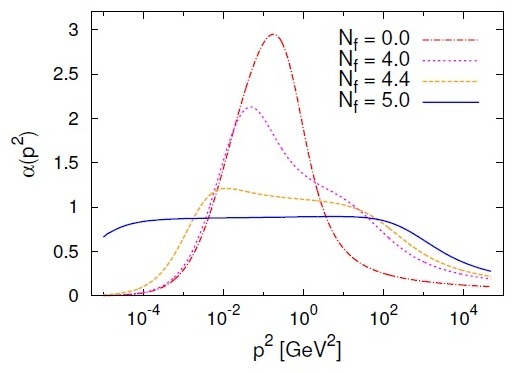 But we would like to note that the result given by Nair, Karabali and Yelnikov is in close agreement with lattice data. In 3 dimensions the string tension is a pure number and can be computed explicitly on the lattice. So, we are supporting each other with our conclusions. These results are really important as they give a strong support to the ideas emerging in these years about the behavior of the propagators of a Yang-Mills theory at low energies. We are even more near to a clear understanding of confinement and the way mass emerges at macroscopic level. It is important to point out that the string tension in a Yang-Mills theory is one of the parameters that any serious theoretical approach, pretending to go beyond a simple phenomenological one, should be able to catch. We can say that the challenge is open. Yang-Mills theory with the related question of the mass gap appears today an unsolved problem and, from a mathematical standpoint, the community did not recognized anybody to claim the prize so far. But in physics the answer to this question has made enormous progress mostly by the use of lattice computations and, quite recently, with the support of theoretical analysis. Contrarily to common wisdom, the most fruitful attack to this problem is using Green functions. The reason why this was not a greatly appreciated approach relies on the fact that Green functions are gauge dependent. Anyhow, they contain physical information that is gauge independent and this is exactly what we are looking for: The mass gap. In order to arrive to such a conclusion a lot of work has been needed since ’80 and the main reason was that at the very start of these studies computational resources were not enough to arrive to a deep infrared region. So, initially, the scenario people supported was not the right one and some conviction arose that the gluon propagator could not say too much about the question of the mass gap. There was no Källen-Lehman representation to help and rather, the propagator seemed to not behave as a massive one but theoretical analysis pointed to a gluon propagator going to zero lowering momenta. This is the now dubbed scaling solution. In the first years of this decade things changed dramatically both due to increase of computational power and by a better theoretical understanding. As pointed out by Axel Weber (see here and here), three papers unveiled what is now called the decoupling solution (see here, here and here). The first two papers were solving Dyson-Schwinger equations by numerical methods while the latter is a theoretical paper solving Yang-Mills equations. Decoupling solution is in agreement with lattice results that in those years started to come out with more powerful computational resources. At larger lattices the gluon propagator reaches a finite non-zero value, the ghost propagator is the one of a free massless particle and the running coupling bends toward zero aiming to a trivial infrared fixed point (see here, here and here). Axel Weber, in his work, shows that the decoupling solution is the only stable one with respect a renormalization group flow. These are accepted facts in the physical community so that several papers are now coming out using them. The one I have seen today is from Kenji Fukushima and Kouji Kashiwa (see here). In this case, given the fact that the decoupling solution is the right one, these authors study the data for non-zero temperature and discuss the Polyakov loop for this case. 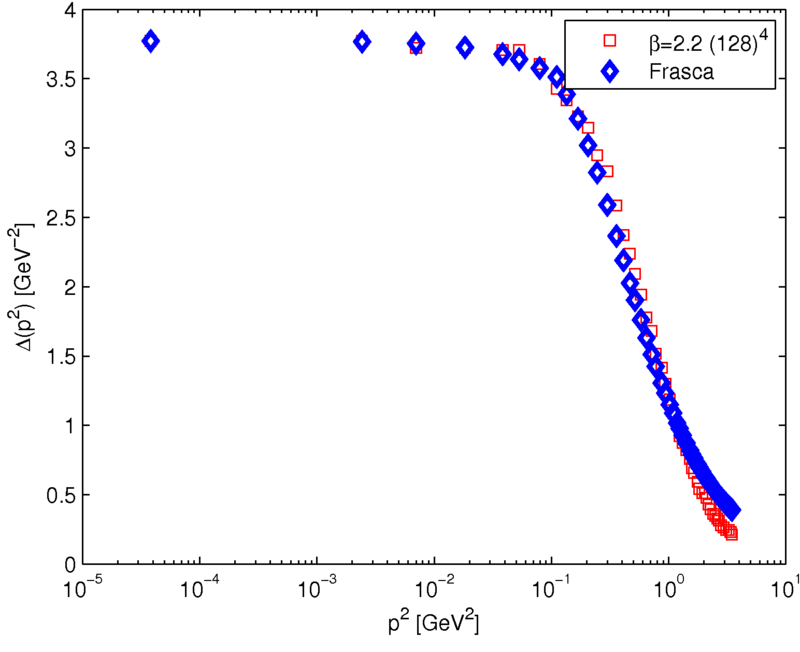 Fukushima is very well-known for his works in QCD at finite temprature. We can claim, without any possible confutation, that in physics the behavior of a pure Yang-Mills theory is very clear now. Of course, we can miss much of the rigor that is needed in mathematics and this is the reason why no proclamation is heard yet.